Power s son(Dram) can hunt the hills all day. We had a good time this weekend. He is 10 now but you would think he is still 4. He is a slim trim running machine that can hunt all day. The stamina your line has on prairie grouse not many dogs can claim. I been chasing them for 35 years now and have seen many seasons. The only thing he did wrong was my fault. A bird landed on the hill 6 foot from a skunk. He pointed the bird and ran past the skunk I flushed the skunk and missed the bird in all the commotion. Not bad for an old fat guy with a good dog and a 28 gauge. He is a pretty good retrieve also; he retrieved all of the above. Dram is 9 now and has more stamina than many 3 and 4 year old dogs. I have never seen a dog that can hunt all day and not slow down in the big hills. He would have made a very good trial dog if I would have followed that path. 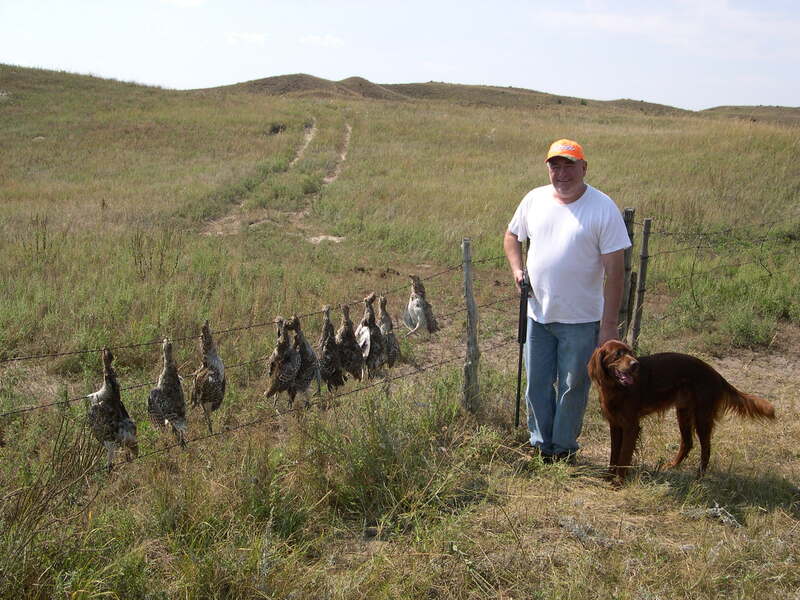 He has seen many Sand hills grouse about 40 miles from where your base camp is. His littermate sister is very good on pheasants. She is still putting a lot of dinners on the table for her owner. Hi! Jan Roger pointed me to your website, which I've now visited and read with great interest. I'm taking the opportunity to send you some info about Scott (Clint - Jada), now 20 months old. Hope you find it of some interest and hope that the attached picture files are not too large to handle. Scott is a wonderfully bright and happy dog with speed, endurance and grace, and a charming personality too! He settled in very quickly after we picked him up from Jan Roger 9 weeks old. He's socially very skilled and well balanced, independent yet very cooperative and easily trained. He's a natural member of the family (Wife, son, daughter and cat) and goes wherever we go. As a hunting dog, he is developing very well. We mostly hunt in typical southern Norwegian forests where the landscape features rolling hills and valleys with quite dense woods and small open areas scattered in between. Naturally, this puts great demands on Scott's abilities in terms of cooperation and staying in contact with me at all times, a quality which seems to come natural to him. In the mountains where the landscape is much more open, he automatically expands his hunt, yet stays in sight all the time. Being able to automatically adapt the format according to landscape and vegetation density is a quality in him which I appreciate very much. His first point occurred at an age of only 6 months, and he's had many more since on woodcock, grouse, pigeon, pheasant and capercaillie. He is perfectly calm as the bird takes off. On my 13 years old son's very first hunt and very first hunting shot fired last fall, he shot his very first grouse with Scott pointing beautifully - a glorious "picture book" hunting scene in Telemark mountains which brought tears to my eyes! Needless to say, all three of us were almost bursting with pride. This grouse has now been mounted in our living room as my sons very first hunting trophy. Scott attained a first prize and 'best in race' prize for exterior 9 months old last May. We haven't as yet attended any hunting tournaments as he is still a bit too "childish" and too "distracted" by the other dogs. But come fall and winter and more hunting experience, I'm confident that we're ready to attend some tournaments and maybe even win some prizes, like many of his brothers and sisters already have. Hi Ken, I have returned from det Easter mountain, sunny days and some dog training. Daisy and the other three pups with first prize will join the Artic Cup, a big event for the best young dogs all breeds the weekend 16. of april. Please find enclosed a couple of pictures. Information about the Norwegian Brophys dogs on you web site would be great! You could have some facts (50% (11 of 22) of the pups out of Clint have a prize on trials so far! 15 of 16 has "excellent" hips so far!) Of course we will send you information, pictures and stories! We are told that Brophy's Molly McLucky Charm will be featured on first Pheasants Forever show. The following testimonial from her owner, Bob Sewell..."She's Brophy's Molly McLucky Charm AKC SN595774/02. Breeder, Mike Willetts. She was whelped: 12/04/98. Lucky's dad was Brophy's Red Flash and her mom was Brophy's Bit-of-Honey. Flash's dad and mom were NAFC FC AFC Brophy's Center Fielder and NAFC FC AFC Brophy's Midwest Express. Honey's dad and mom were Brophy's Jose Cuervo and Brophy's Molly by Golly." "Lucky has been a great family pet. Lucky's very good with the kids and grand kids. Lucky has impressed everyone that she meets. Whether it in the field or just seeing her. Everyone says how soft her coat is and well mannered she is. I get invited on a lot of hunts, or should I say my buddies call and ask if Lucky can go hunting, I can come along!!!? It a great sport and a lot of fun.? I have 2 boys age 21 and 15 that love hunting. Lucky has made a big difference on that. We go hunting every chance we get."